Hello, dear Frozenbyte developers. Frozenbyte Collection 2016 BUNDLE currently unavailable for purchase as a gift. Unfortunately this is how the new game packages work on Steam, and it's something we can't really change. Plus side to this is that you can get the games cheaper from bundles (even during sale). If you have any questions about the packages please send them to Steam Support, but we'll happily answer any other questions about our games. 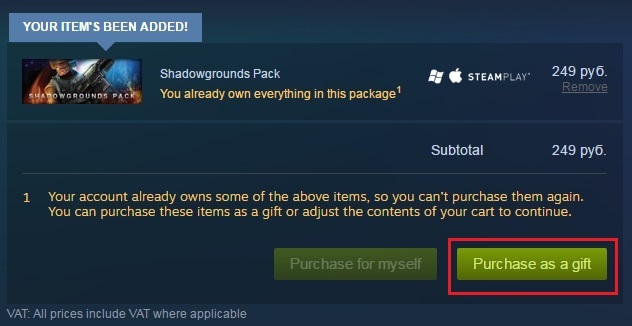 MarjutFB wrote: Unfortunately this is how the new game packages work on Steam, and it's something we can't really change. Plus side to this is that you can get the games cheaper from bundles (even during sale). We are a little worried about adding more packages, because there is a lot of them already. Still we're looking into this, so thank you for your feedback. MarjutFB wrote: We are a little worried about adding more packages, because there is a lot of them already. Still we're looking into this, so thank you for your feedback. Good news. Thank you in advance. Possibility to buy the game as a gift - convenience for gamers and additional profit for developers. What with my request ? I can find out ? Cepera wrote: What with my request ? I can find out ? This is still in-progress for us. Sorry for the inconvience, but thank you for your interest! I can find out process addition game to steam store ? Steps of the process. We are still worried about the amount of packages we already have for Trine 2: Complete Story for example, so no notable progress has been made. I'll however forward your inquiry to the rest of the team. Can I ask that are you insterested in buying this package yourself (if we can get it available)? MarjutFB wrote: Sorry for the delay! No problems, better late than never. MarjutFB wrote: Can I ask that are you insterested in buying this package yourself (if we can get it available)? 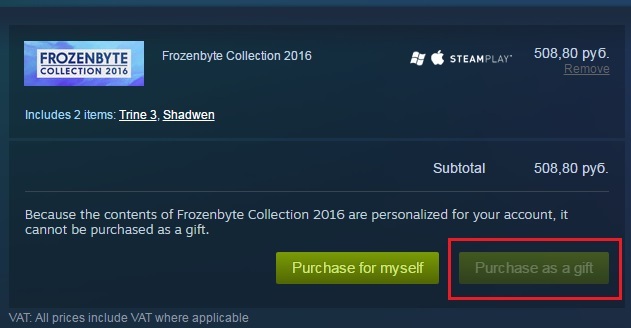 Yes, i would buy Frozenbyte Collection 2016 for myself (you make a good games) and gift for my friends. P.S. Yes, bundles comfortable - they are cheaper for when buying for yourself. The main problem in the bundles - the impossibility purchase them as gift. Company Valve creating one thing - breaks another thing. This is Valve. We've been hearing about this ever since we moved to the new bundle system We'll talk to Steam about it and see what they think. If the choice is between the two options, I feel the current (new) system is better for most users. Let's see how it goes. fb_kai wrote: We've been hearing about this ever since we moved to the new bundle system We'll talk to Steam about it and see what they think. If the choice is between the two options, I feel the current (new) system is better for most users. I would be interested know the opinion Valve. Any news on my question ? Cepera wrote: Any news on my question ? Unfortunately no news at the moment, but I'll forward your inquiry to our Marketing team (again) and we'll post you here if there are any updates. Sorry for the inconvenience, but hopefully the week is starting nicely for you. Cheers!